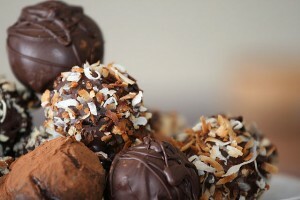 Truffles with nuts and chocolate dusting in detail. *It is week 9 of Masterchef (US). 12 remain after Elise was sent home last week. This weeks challenge was to cook a romantic meal for couples in the MasterChef dining room. Each couple was celebrating an anniversary. One couple had been married 65 years! Another got engaged. Yet this episode seemed off to me. Perhaps it is one of those feelings you get after watching a reality show over many seasons. Perhaps it was a little déjà vu. I could not put my finger on it right away. Both Elizabeth and Ahran are team captains. Elizabeth (Blue Team) picks Francis, Jaimee, Victoria, Courtney, and Daniel. And Ahran (Red Team) picked Big Willie, Christine, Christian, Leslie, and The Cutter Zone. There task was to prepare a romantic dinner for the couples in the dining room. But wait, there is more! Gordon Ramsay’s wife Tana has arrived so he and his very lovely wife will also be dining. Elizabeth says she was recently married and misses her husband. Ahran says she really cannot get into the event since she has never been on a date. Oh boy. You can just see lots of creepy proposals coming her way over the Internet. Team Elizabeth decided to do a filet mignon for the entrée and and Team Ahran lobster risotto. Unfortunately the filet mignon’s came out rare. They tried heating them up in the oven but it did not work. Gordon and Tana’s filet was rare. Somewhere a cow was mooing. Ahran’s lobster risotto had problems as well. The lobster itself was fine but the risotto lacked a deep lobster flavor. The deserts were mixed as well. Ahran’s tiramisu did not come out as planned so they had to improvise by stacking it like lasagna. It looked rushed and was missing raspberry flavor. Elizabeth’s cake had too many strawberries and Tana said they were eating around the center which was not a good sign. Each table had to decide on one winner, no split votes. Do you go for the rare filet mignon with an overdone strawberry cake or a lobster risotto (with no lobster flavor in it except the lobster on top) with a clumsy looking tiramisu whose raspberry flavor is elusive? Well the diners went for Team Elizabeth leaving Team Ahran to face the dreaded pressure test. Something rings wrong about this. I cannot place my finger on it exactly but it is too pat. They showed other tables facing the problem of which was really better. And it was not even close with 75% of the vote going to Team Elizabeth. Whatever happened it sent Team Ahran to the pressure test. All of them, no exceptions. There are pressure tests and then there are the Pressure Tests From Hell. Most pressure tests are something you would cook at home or something you might find in restaurants. Then there are pressure tests that are designed to make people fail. There is no other explanation for them because what you have to cook would not be done by home cooks. You would never see it on America’s Test Kitchen or even an old episode of Julia Child. If you go to any major city in the US and ask 1,000 people if they make chocolate truffles at home, you would be lucky to find one. And they have to make nine delicious and visually appealing specimens all done to the judges satisfaction. Leslie. His truffles looked like some small mythological creature had stomped on them or as Gordon speculated put under his armpits. They looked horrible. They tasted better than they looked but you get one guess as to which two were on the bottom. I thought they would send both home. But if you are going to save someone, which do you choose? Do you save a gal who has shown considerable strengths and leadership in the kitchen? Or do you choose a guy who does cook well but does not get along with anyone else and is infuriating at the same time? Who do you see in the top four? I wish they would think that way because they sent Christine home. I think they wanted to do a double elimination but the wrong two ended up in the bottom. Elizabeth-She has shown considerable skill and tenacity. Courtney-Those glossy shoes belie a person who can cook real well but will mow down anyone in her way to the top. Big Willie-He ought to be in the top section but while he is a good cook, right now he is more comfortable with home and rustic cooking than fine dining. He could break out but for now he is in the middle. Jaimee-Very good and could move into a top position if one of those guys screws up. Victoria-A consistent good cook who works well with others. Daniel-Determined and earnest in his cooking. Ahran-Her youth and inexperience are made up for with determination and taking risks. Leslie-He can produce good dishes, no doubt of that. But head to head against Courtney, Elizabeth or Christian he will likely loose. He was a poor team leader and on the kitchen challenge had to be pulled off his station because he got rattled and started producing poor egg dishes. The Cutter Zone-Though he did good in the pressure test, overall he has yet to either be in top three for a mystery box challenge or win an elimination. At this stage of the game, the field is narrow and he has to prove himself. Down to eleven now so the competition is going to get even tougher. And it looks like a double mystery box next week. 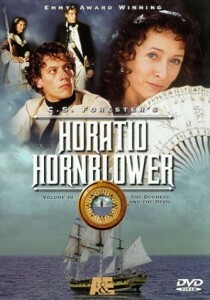 This episode is based on Hornblower and Duchess and The Devil in CS Forester’s Midshipman Hormblower. Hornblower is taking a captured French ship back to England with Duchess of Wharfedale aboard when Spanish ships appear and he is taken captive. While Midshipman Hunter plots escape, Hornblower helps Midshipman Kennedy recover from neglect. A failed escape attempt by Hunter puts Hornblower in solitary confinement. Later his heroism in saving Spanish sailors gains liberty for himself and his men. Approximate date: Sometime after August 1, 1796. No exact date given in book or television series. Acting Lieutenant Horatio Hornblower captures the small French ship Le Reve and returns to Gibraltar. There he is informed he will take the ship back to England. Before that he must attend a important dinner with Sir Hew Dalrymple, the governor of Gibraltar. There he meets her grace, the Duchess of Wharfedale, who is of common birth unlike most ladies married to men with aristocratic titles. She was in Italy when the French arrived and made her way to Gibraltar. It turns out that Hornblower will be taking her back to England on his ship. During the journey the find themselves not only in fog but surrounded by Spanish ships. They try a ruse by raising the French flag and even putting on French clothing. However the ruse is detected and Hornblower surrenders rather than risk the lives of the crew in a senseless battle with overwhelming odds against them. The Duchess decides to conceal the admiralty dispatches since the Spanish will not search her. After surrendering, they are taken to a nearby prison. The Duchess is also interned nearby awaiting transport out. In the cell, Hornblower finds Midshipman Kennedy, whose longboat was set adrift by Simpson in The Duel. He looks bad and Hornblower tries to help him. Midshipman Hunter wants to escape but Hornblower orders him to wait until they can all go. But they gather intelligence in the meantime as to how many guards there are and other things. The Duchess is allowed by the commandant to visit Hornblower and walks with her while on parole. Hunter becomes suspicious that Hornblower is not interested in escaping anymore and starts plotting. Kennedy’s health worsens due to Hunter denying him food forcing Hornblower to ask for help. This is done and the Duchess helps out. Kennedy, in delirium, recognizes her and she is forced to admit she is not really the Duchess of Wharfedale but the actress Kitty Cobham. Hornblower is shocked since she is carrying important documents for his government. Meanwhile a visiting French colonel, while having dinner with Don Masseredo, the Duchess and Hornblower, also recognizes her but does not unmask her in front of the commandant. Instead the Duchess decides to spend a romantic evening with the colonel. Hornblower is nervous but fortunately turns out okay in the end. Not long afterwards, she leaves but convinces the commandant to allow him to learn Spanish using the book Don Quixote and a lexicon. Meanwhile Hunter has decided to make his escape plans and convinces a number of them to join him. Matthews and Styles do not join in but Oldroyd does. When the escape occurs, Hunter and his group make it out to the main area before being stopped. Hunter is shot but Hornblower pleads for their lives. The commandant wants to know who the plotters were not believing for a second that Hornblower would ever of approve of such an escape plan. Hornblower takes full responsibility and is put in the pit, a cell that does not allow a man to either lie down or stand up. Hunter, who was shot (and wants to die) has to watch from his cell Hornblower taking responsibility for his actions. Not long after Hornblower is released, he sees a ship being chased by Indefatigable and strikes the nearby reef. The water is treacherous and a storm is raging. Giving parole for both himself and his men, he sets out to save the crew of the ship. The Duchess turns out to be aboard. Midshipman Hunter decides to swim away because of the guilt he has over what happened during the escape. They are rescued by Indefatigable and welcomed aboard. Pellew is not happy that the Duchess had the admiralty documents but also says Hornblower is no longer an acting lieutenant and has been promoted to Lieutenant Hornblower. Pellew asks Hornblower’s crew if they will honor the parole he made to the Spanish. They do and they all return (except the Duchess of course) to shore. Sometime later Hornblower is informed that the First Minister of Spain, in recognition of the heroism to rescue Spanish lives, that he and his men are to be set free. The commandant wonders if they recognize they are letting loose a man who will be a thorn in their sides. Hornblower smiles and tells the commandant he will endeavor to prove them right. *Hornblower does attend the dinner but not with Captain Pellew as he his ship had not yet returned. *The ship is captured but they did not attempt raising French colors or wear French uniforms. Hornblower tried evading in the fog but the Spanish frigates closed in and fired when the fog thinned out. *The duchess admits she is Kitty Cobham aboard ship and does hide the admiralty documents. Also the maid she had is deleted for the television presentation. *Midshipman Kennedy was not in the cell as in the book he was never cast adrift. *There is no subplot involving Midshipman Hunter nor an attempted escape. *His promotion to lieutenant occurs while imprisoned. The commandant informs him of the promotion and puts him in officers quarters and half pay. *Kitty Cobham/Duchess of Wharfedale is not seen after after the ship is captured. She sends Hornblower a letter that the documents were delivered and wishes all is well with him. *In the book he was imprisoned for two years but the dramatization makes it likely it was a six months or perhaps just short of a full year. Of all the adaptations from Midshipman Hornblower, this is my favorite. It takes the story and actually makes it better. The essential story is Hornblower captures a small French ship and is captured taking it back to England with the Duchess of Wharfedale aboard. She secretes important naval documents and ends up home in Britain while Hornblower is imprisoned in Spain. He is only released after he and his crew save Spanish sailors whose ship crashed on the reef nearby. So the writers had to come up with a way to make the story much better and interesting to fill 90 minutes or so of television. The character of Midshipman Hunter was expanded greatly as a contrast between two junior officers. Hunter was the older midshipman that saw a younger man rise fast and having to take orders from him. While others considered Hornblower lucky, Hunter downplayed or questioned his methods like how he took Le Reve. 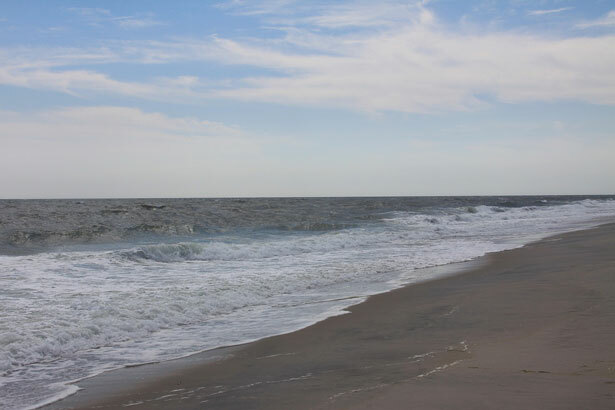 Hornblower and his men had taken captive the shore party and dressed in their clothes so they could approach the ship and take it by surprise. But Hunter said, in front of Matthews and Styles, that the prize money might be denied if they knew about the ruse Hornblower used. He also thought him less aggressive in wanting to fight the French or in his desire to escape. Hunter further alienated himself with Hornblower through his dismissive attitude to Kennedy and his disobeying orders in the doomed escape attempt. Bringing back Kennedy was odd though. His character is in some of the early stories but not much beyond that. We last saw him in The Duel where after an epileptic fit he had to be left in a long boat during a raid. Simpson cast his boat adrift and he floated into French hands. The only way he could be in Spain was that he escaped and headed there since it was an ally at that time. Alas probably by the time he made it, Spain was on France’s side and he was imprisoned. At any rate he was in bad shape and likely would have died without Hornblower’s help. Hunter was willing to let him die rather than bring him along. Kitty Cobham/Duchess of Wharfedale was a clever character. She decided to impersonate the duchess so that she would not be ill-treated And she pulled it off both in the book and the televised drama. In the book, she told Hornblower before the Spanish came aboard Le Reve. While the men and officers would be searched, a duchess would not. Of course it came at a risk. If they ever suspected she was not a duchess, she would be arrested. And of course if they found the documents on her, she probably would be accused of being a spy and executed. In the book she was sent back to England and delivered the documents. The movie greatly expands her character by having her interned nearby while waiting transport to England (via Portugal) so she visits with Hornblower. Later she helps the very sick Kennedy recover. Unfortunately that is when he recognizes her as the actress. And much later the visiting French officer recognizes her as well but does not unmask her to Don Masseredo, commandant of the prison. She spends a night of romance with him which makes Hornblower uneasy. Yet as in the book she is loyal to both Hornblower and England. Don Masseredo was never identified as such in the book, just the commandant of Ferrol prison who seemed pleasant enough. He did not speak English much and used an Irishman to do that for him (many Irish found jobs working or living in Spain during this period). Don Masseredo comes across as a gentleman but he is a Spanish army officer not to be trifled with either. The duchess uses all her skills with him to allow Hornblower parole and to bring fresh fruit (which Hunter despises and smashes them up). Another touch not in the book is after she left asking him to have Hornblower learn Spanish reading Don Quixote with a lexicon. Certainly the educated Hornblower would have known about the book as English translations had been around for a while. And it is considered one of the best Spanish books in all history and helping spread modern Spanish as well. I’m afraid he is no longer my acting lieutenant! As a result of exemplary gallantry in the fire ship attack on Gibraltar, an opinion shared by three captains no less. Captains who would not normally even agree on the color of the orange. His promotion was confirmed in last dispatches. He is now commissioned Lieutenant Hornblower. An enjoyable episode to watch and the best of the Midshipman Hornblower adaptations. *Sir Hew Dalrymple was a real person. He was not governor of Gibraltar during the French Revolutionary Wars but was Acting Governor from November 1806-August 1808. However his actions in Portugal as Commander of the Portuguese Expedition in 1808 resulted in his being recalled for an official inquiry and to never hold field command again. 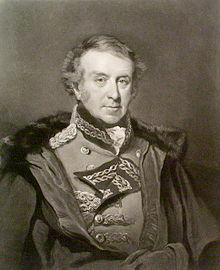 With the French forces under General Junot defeated and on the run being pursued by General Arthur Wellesley(later Lord Wellington), he was ordered to cease by Dalrymple. Dalrymple negotiated the infamous Convention of Sintra which allowed all the French forces in Portugal (29,900) to be evacuated back to France courtesy of the British Royal Navy. Worse they were allowed to bring personal articles and weapons as well. The Portuguese were outraged by the deal which allowed them to take items stolen from Portugal. It was seen as a disgrace back in London. While the inquiry acquitted all concerned, Dalrymple was eventually promoted (due to seniority) to full general and then quietly retired. He was formally denounced by the government. He then was made governor of Blackness Castle from 1811 to his death in 1830. In short, sent to the rear where he could due the least damage and put in charge of an ancient fortress used as a military prison during the Napoleonic Wars and not much else after that. *There is no title of nobility for Wharfedale. In fact Wharfedale is one of the Yorkshire Dales in the upper valley of the River Wharfe. *Prize money was awarded when a navies in time of war seized merchant or military ships of the nation at war with. The British Royal Navy developed a series of rules about how it was to be done and was formalized in the Cruisers and Convoys Act of 1708. For merchant ships that were seized, the sale of cargo and ship would be the prize money to be divided up. 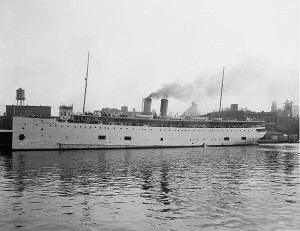 Military ships (supply, dispatch and warships) were almost always purchased by the crown providing they were in good shape. Which is why, even with cannons that could sink ships at great distance, they would close in and take if they could. All ships that sighted the enemy craft that was captured were eligible for prize money. Money was allocated in eighths with the ships captain getting the most (which could make him very wealthy), along with admirals who ordered the orders, all the officers and crew got a share as well. Share money for the ordinary seamen could equal several years of pay. Privateers could seize enemy ships if they had a Letter of Marque granting that power but they also had to play by rules as well if they were to be paid. Those days are long gone and prize money is no longer awarded to naval officers who take enemy ships. They can be taken to a prize court and sold but the government gets the money now. The Bangles Do We Belong and Sleeping Beauty Too! When most people think of the song We Belong they naturally think of Pat Benatar. Her rendition is powerful and out of this world. Less known is a cover that The Bangles did. It is on the album Keep the Light Alive – Celebrating the Music of Lowen & Navarro but was also used by Walt Disney for Sleeping Beauty video. It really is a wonderful rendition of a great song and using it with the visuals of Sleeping Beauty adds a whole new dimension. Enjoy and have a happy Sunday everyone. *It is week 8 of Masterchef (US). 13 constestants remain after Dan was sent home last week. One of the interesting things about Masterchef is that we see varying levels of confidence and abilities. All of the contestants are amateurs. A few work as servers in restaurants but not as cooks. 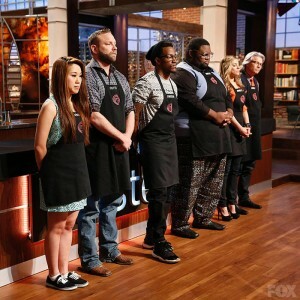 Each competition could be their last so they must focus on cooking best at all times. Pressure and other things can cause a promising candidate to go home. And if you loose confidence in your abilities as a cook, likely you will be sent home. If confidence is a factor, a degree of arrogance usually follows. Of course it cannot be overwhelming arrogance that ends up being hubris. All three of the judges are extremely confident in their abilities and have arrogance about them. But not so much as to offend. The arrogance comes from years of practice and experience. What they look for in the cheftestants are both confidence and the ability to negotiate difficult tasks well. What separates a chef from a cook is how well they can create and execute a dish. And on this episodeof Masterchef, confidence is what you need when faced with a whole king salmon to filet and make a meal out of worthy the judges to consider. Sad to say that a wonderful lesson in filleting a fish was squandered by the cheftestants. Gordon is an expert at this and his knife skills are extraordinary. Yet not one cheftestant bothered to watch. Of course some will say they never invited anyone down to watch. That misses the point. Nothing stopped them from going to down to see how he filleted a fish. If I had never done it before (like Ahran), I would have watched his technique. Gordon was done while everyone else was either still scaling their salmon or just starting to cut it up. Graham came down to cook Gordon’s salmon fillets, and Joe got to eat it. Joe got the best of the deal there. Christine totally botched her filleting. The fillets looked like, as Joe put it, a shark had nibbled on them. Apparently she washed them in water and that resulted in them looking ragged. Elise had a health scare. She started feeling woozy. Gordon had water and a medic come over, and then a chair. It either was stress or fatigue and she ends up going outside to be more closely checked by the medics. She came back with thirty minutes to spare and did not have to cook. But she did and Christian thought well of that. Christian went a route most would dare not brave: Cajun blackened salmon. And it was worth the risk since his dish was the best of the round. Off he went to the pantry to make an important decision on whose food basket (Gordon, Graham’s, or Joe’s) would be cooked by everyone. He choose Joe because it looked more complex (and heavier as well!). But of course there is a twist just before cooking and Christian gets to decide which person will only have thirty minutes to cook instead of sixty. He choose Courtney. That would not be my choice. I know she is a good cook and probably could ace it. Instead I would think in my head who are the other top ones and of that group, which are the weakest right now. I would have chosen between Willie and Ahran. Ahran because of her youth and lack of experience would have problems. And Willie is not so comfortable with upscale cooking. I would go for Willie. He choose Courtney because he does not like her much. Except, as I thought she would, she handled the challenge very well. So did Ahran and Elizabeth. Ahran decided to make a savory tiramisu. That is nearly unheard of. The judges could not believe it and had doubts it would work out. Cutter opts to make pizza. Except there was no flour in the basket to make pizza. No problem in The Cutter Zone! Willie goes simple with tomato soup with egg and flatbread. Talk about uninspiring. This does not scream of Masterchef but a simple weeknight supper. Poor Elise though is having the most problems. Her first attempt at making pasta was a complete failure and she is demoralized. Gordon helps out and tries to get her not to give up. Courtney had the disadvantage of only thirty minutes to cook. She manages to put up a decent dish that all the judges liked. Christian said she took the easy route, the judges do not agree. She is safe and not going home tonight. Courtney displays a level of confidence that borders on arrogance. The thing is, she can usually back it up. At one point early on she mentions she does not want to go back to working in a “gentleman’s club.” So she is hoping this will be a ticket out and be able to help her family. So she is clearly motivated to go as far as she can. Her mercenary aspects though tend to irritate the others. Christian hoped to trip her up and failed. He whined her dish was too simple and Joe retorted he misused his advantage. He aimed his arrow at someone with strong armor and it bounced off. Christine redeemed herself with mushroom caramelle with brown butter and sage sauce. Leslie did fine with his artichoke ravioli but he needs to work on his presentation. Big Willie was a big disappointment. His dish was a tomato soup with egg and flatbread. He is given some really great Italian ingredients and this is all he came up with? Wow. Totally disappointing and it shows he did not have the confidence to make something more impressive. When it came to impressive,two dishes really shone out: Ahran and Elizabeth. Ahran made a savory tiramisu. Gordon was very wary of this dish and asked if she had been drinking. No and she does not even know how to open the bottle! Gordon took a bite and from watching him on Kitchen Nightmares I guessed he was saying a prayer. Well it worked because the tiramisu was delicious. Never in a million years would he have thought of making such a dish but she had the confidence, despite her lack of experience in Italian cuisine, to pull it off. He was genuinely amazed by the skill she displayed for a person so young. Even if she does not win the competition, my guess is Gordon will get her into the business (as he has done with other young cooks). She clearly has talent. And so does Elizabeth. She made a breakfast lasagna with egg on top with artichoke heart salad with bechamel sauce. Joe loved this dish and said it represented exactly the ingredients in the basket. He could not be more pleased and she went back to her station glowing in his admiration. Sadly neither Elise or Cutter can say the same. And now for trip down that lane to….The Cutter Zone. Cutter spent a entire hour to present the judges with a small artisanal pizza sitting on a sauce. Gordon cannot believe this is all he is presenting. He sarcastically asks Christian if gave Cutter less time than Courtney. 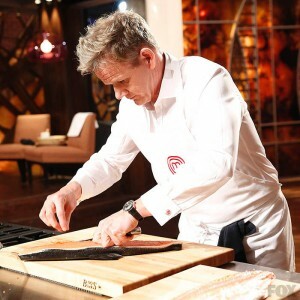 It is not Masterchef material says Gordon. Joe was even more unimpressed than Gordon asking why he put the bread on sauce since it does not make the pizza crispy. Cutter wanted to add color to the plate. Joe spits it out and discards the plate. But at least Cutter thinks it was good. Time to leave this strange dimension and back to our normal reality. Elise has had her moments but the stress got to her. And she has a problem picking herself up when making a mistake. Instead she gets despondent and looses confidence in her abilities. So her plate of ravioli, is as she puts it, sad. The sauce is not seasoned and Gordon asks if she has given up. She tries saying no but as Gordon points out, the dish says she has. So she is on the bottom with Cutter. Willie would have been there had there not been two dishes so poorly done as there was no other competition. They were faced with one cook who had given up and another who resides in different dimension where his food is never bad. While they would like to send Cutter home, Elise has totally given up. So they send her home and Gordon advises her not to give up and learn from mistakes. He has made plenty and did not give up. This episode, perhaps more than others, highlights the differences in confidence and learning from mistakes. Christine botched the filleting in the Mystery Box and came back strong in the elimination round. Christian thought he would unnerve Courtney by giving her less time but her confidence in her abilities gave her a win. Willie, perhaps unfamiliar with the ingredients, decided to play it safe not having the confidence to try a pasta dish and ended up on the bottom. Ahran took a bold step in doing a savory tiramisu. We have seen some spectacular failures with tiramisu in the past. Yet her boldness and confidence bore out in a surprisingly delicious dish that made her a team captain in the next round. And Elizabeth showed her talents as well. She is most definitely a front runner now and perhaps the greatest challenge to Courtney and Christian. As for Cutter and Elise, well one is in a delusion and the other collapses when they fail. Elise needs to build confidence in her abilities and when mistakes happen learn from them and not give up. Cutter is a whole different issue. This is a guy so into his own self that he is The Cutter Zone, a self imposed bubble that he developed so that criticism bounces off his chest like bullets off Superman. Remains to be seen how long he will last on the show. He has to count on someone else being far worse than him. And one day that person will be him. Titanic II is scheduled to be launched from its construction base in China in 2018, before her maiden passenger voyage retracing its original journey from Southampton to New York. I have to admit being duped on this. I did not read the full release as close as I ought to have. I did a write up on the MOU but did not notice that little line at the end. And nor did anyone else but, if I recall correctly, Blue Star did not point people to it either. Instead it seems they let people continue to believe might be launched this year all the while covering themselves in this release. Of course it might be moot if the dispute between Palmer and the Chinese government remains unresolved. Roy Orbison was a great singer-songwriter that many other performers respected. He had distinctive powerful voice and his music had complexity to it. His trademark sunglasses and dark clothes added an air of mystery. He was very popular in the 1960’s but slowed down in the 1970’s. His career began to revive in the late 1980’s as some of his music was used movies (Blue Velvet for one). In 1987 he collaborated with Jeff Lynne of Electric Light Orchestra on the album Mystery Girl. The song “You Got It” written by Lynne and Tom Petty would rise to the top of the charts in both England and the US. Sadly Orbison would pass away before that occurred. The album came out in November 1988. His last concert was on 4 Dec 1988 at The Front Row Theater in Highland Heights, Ohio. He was exhausted and people noticed he did not look well. On 6 Dec 1988 after playing with his sons, he had a heart attack and died. He was 52. He left behind a library of songs that are still popular to this day. “You Got It” is still quite popular and, perhaps next to the Bangles “Eternal Flame” is a song sometimes heard in movies or television shows when people are talking about love, or in love, or about to get married. Here is a performance of “You Got It” at the Diamond Awards in Antwerp, Belgium on 18 Nov 1988. Have a nice Sunday everyone.